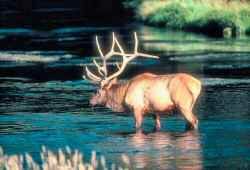 One of the most scenic and remote regions of Penn's Woods, northwestern Pennsylvania's "Elk Country" offers a great opportunity to view Pennsylvania elk and other wildlife. The following destinations, as suggested by the Pennsylvania Game Commission, are some of the best places to view Pennsylvania elk in safety. Winslow Hill - The most visited elk viewing site in Pennsylvania, with two established viewing areas, off-road parking, and portable restrooms. Other wildlife also commonly seen. Location: Winslow Hill Road, 3 miles from its intersection with Route 555 in Benezette. Sinnemahoning State Park - Enjoy watching the small resident elk herd from the viewing platform, plus other activities and opportunities for wildlife viewing, including nesting bald eagles. Overnight camping available. Location: Viewing area along Route 872, 14.5 miles north of intersection with Route 555 at Sinnemahoning. Hicks Run Viewing Area - This small area near a cemetery offers a great location for photographing elk and other species. Location: Along Route 555 about 12 miles east of Benezette. Elk Trail - This 19-mile non-loop trail offers the chance to enjoy elk and other wildlife in their natural habitat. Location: Parking only along Dents Run Road, about 2 miles north of intersection with Route 555, 10 miles east of Benezette. Thunder Mountain Equestrian Trail - 26-mile loop provides the chance to see elk in remote habitat, with connector loops for shorter and varied rides. Location: Trailhead and day-use parking for equestrians along East Hicks Run Road about 3.75 miles from intersection with Route 555, 12 miles east of Benezette. Beaver Run Dam - Shallow water impoundment with a field where elk often graze, also offers alternative wildlife viewing during the day for waterfowl, wading birds, deer and songbirds. Location: Along the Quehanna Highway, about 9.5 miles southeast of its intersection with Route 555 at Medix Run. Proposed Elk Scenic Corridor - Connects "Elk Country" to Interstate 80 and is the best southern access to the recommended viewing sites. Access from west via Route 153 at Exit 111. From east, at Exit 147 via Route 144. Route 555 - travels through the heart of the elk range from Weedville to Driftwood along the scenic Bennett Branch of Sinnemahoning Creek, passing through small towns like Caledonia, Medix Run, Benezette and Dents Run. Bucktail Highway, Route 120 - 75 miles from Emporium to Lock Haven winding through a magnificent river valley. Designated state park scenic drive. Route 144 - through the most remote part of Sproul State Forest, an Audubon-designated Important Bird Area. Spectacular views at Dennison Run Overlook, about 10 miles south of Renovo, and at Burns Run Overlook, about 15 miles south of Renovo. Wykoff Run Road to Quehanna Highway - from the village of Sinnemahoning, drive south on Wykoff Run Road and enjoy a spectacular stream valley. At the intersection with the Quehanna Highway, 10 miles south of Sinnemahoning, turn right for a gorgeous 13-mile drive through the Quehanna Wild Area to Medix Run on Route 555. Route 6 Corridor - 400 miles winding through Northern Pennsylvania through some of the nation's most beautiful natural areas and fascinating small towns. Named "One of America's Top Ten Scenic Drives" by National Geographic Magazine. Follow Route 155 north from Emporium. To increase your chances of seeing elk, time your elk watching for the hour or two after dawn, or before dusk, when elk are most visible. For your safety, do not approach the elk for photographs of to pet them, and remember that it is unlawful to feed elk in Pennsylvania.